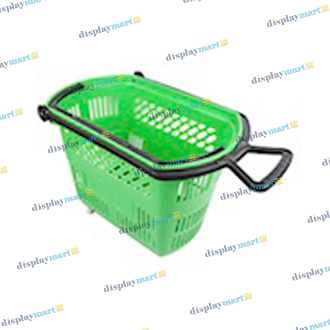 The plastic shopping baskets found on DisplayMart.com are top quality, solid construction products that are perfect for any retail store. Allow your customers to shop around! Shopping baskets are a great way to let your customers carry the product they want to purchase while they search for more. These rolling plastic baskets each measure 18 3/4" long X 13 1/4" wide X 12 1/4" high, come with four wheels & a pull handle, and are available in blue, green, red, and yellow finishes.